When I educate clients about the inclusion of individuals with disabilities in America’s workforce, the top issues I address are Accessibility, Accommodations, Training, Outreach and Recruiting Plans. Is your website accessible? Can all people access your site and career page? Do you know? Please don’t rely on your third party for this answer. It falls on your the company in the end. Make sure! Have you trained your recruiters, hiring managers, support staff and co-workers on how to interact with individuals with disabilities during an interview or how to position a candidate with an obvious disability to a hiring manager? Do you have an accommodations process? Is it a proactive process? Has the onboarding process been reviewed? Have managers been trained in supervising employees with disabilities? Is there training for the employee who may have coworkers with disabilities? Many companies have no idea what to do when it comes to disability inclusion. Let’s face it: disability has been ignored. With 7% measurement—and as the saying goes, “what gets measured gets done!”—the time has come for us, as government contractors, to do a better job in the inclusion and employment of individuals with disabilities. It IS the larger minority that anyone can join at any time and it IS the least talked about at conferences and within our companies until recently. Now is the time for government contractors to receive annual training on disability etiquette with regard to interviewing and communicating with individuals with disabilities. Understand the facts verses the assumptions. To this day, it is fear and attitude barriers from companies that leads to individuals with disabilities not getting hired—not the lack of skills and abilities. It is my humble opinion that it’s the companies that have limitations, not the individual who happens to have a disability. 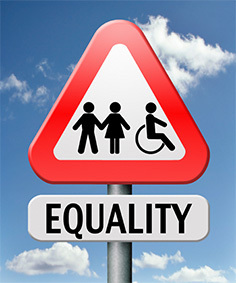 People with disabilities are educated and waiting for an opportunity. It’s time for companies to get educated and open their doors to individuals with disabilities to those opportunities. Through my experience I have been a part of hiring hundreds of individuals with disabilities for professional positions, which drove millions of dollars in revenue. How did I do this? It starts with education and champions within the organization who are dedicated to a successful recruiting and hiring process. Government contractors are now being put to the test. Don’t get caught with your head in the sand. This is real and it is going to continue. As a contractor you must open your eyes and begin a successful implementation plan for the inclusion of qualified talent who happen to have a disability. Don’t get caught not trying…take action now! Get educated, realize your gaps, and then implement an action plan. October is National Disability Employment Awareness Month. What are you going to do to celebrate?